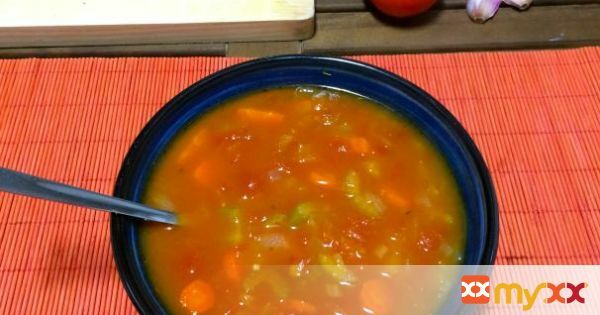 Although I have been a soup fan my whole life, I discovered tomato soup quite late, it was during a trip to Belgium 6 years ago. Soup is a very typical Belgian dish and there was a varied offer in every restaurant menu. Of course I tried as many as I could!As one usually remembers first times of important events in life; I specially recall my first tomato soup. I had it in a lovely restaurant in the charming city of Bruges (unfortunately I did not record the name). It was served with tiny meatballs, which stroke me as a great way of serving meatballs in style. Since then, I sometimes copy this idea, but I wanted a super light and easy supper this time, so I didn't include meatballs.This is a simple story for a simple, but mouth-watering recipe. I added my twist to this version. Let's go with it! 1. First heat the oil in a a cooking pot. 2. Add the garlic, onion, celery, carrots and cumin seeds and sauté over medium heat until softened. 3. At this stage, cumin perfume will start filling the kitchen. 4. To continue, pour the vegetable stock, the diced tomatoes with their juice and the bay leaf. 5. Season with salt, the mix of peppers and the hot and sweet paprika. Stir, and brig to a boil. 6. Cover, turn down the heat and simmer for about 30 minutes if you want your celery and carrots crispy. If you prefer them soft, cook for an extra 10 minutes.